I mentioned having had a sudden desire for a new camera (John: this is *still* your fault), and I’ve been unable to shake it off. I’ve been looking at some Fujifilm Finepix bridge cameras (heh… see all the terminology I’m learning, eh? ‘Bridge’ camera, indeed! ), but even though I’m no real photographer I couldn’t shake off the feeling that I didn’t want to buy a camera that www.dpreview.com has slated for image quality when I already have such a nice Canon compact (the Powershot A95). Yesterday evening, though, I stumbled across some reviews of the Panasonic Lumix DMC-TZ7, and a few hours later a sort of finger twitch moment occurred as I studied the Amazon page, and somehow I pressed the ‘One Click’ button for ‘Next Day Delivery’… Oops! The TZ7 (TZ as in ‘travel zoom’, apparently) has an ultra-lovely Leica lens. It’s 25mm at the wide end, and goes to 300mm (in 35mm equivalent, as I now know they say). It doesn’t offer much manual control, so wouldn’t suit a lot of all y’all camera experts out there, and unfortunately it doesn’t have a viewfinder, but it has a range of pre-set ‘scene modes’ which are said to work extremely well, and I think they’ll be just great for me on backpacking trips. After reading hundreds of reviews of all sorts of small cameras I realised that they don’t tend to be very good in low light, due to their small sensors (I think), but this one seems to do better than most. It also does HD video. Here‘s a gallery on http://www.flickr.com which shows what it’s possible to do with this little camera. If I ever get anything even half as lovely as some of those then I’ll be a very happy little piglet indeed. The only problem that really stood out as I read about it concerns the battery. I prefer cameras that take ordinary batteries that I can buy in shops along the way, which is why I bought a Canon Powershot in the first place. I know that it’s possible to get by with a rechargable battery, though, if carrying a spare (or 2), and the charger. Unfortunately, reports seem to indicate that battery life on this camera is pretty dire. Panasonic claim that it’ll take 300 pictures, but many people seem to have had only a third to a half of that, particularly if recording any video. What made this more than just a major faff that could be circumvented by the carrying of several spare batteries was that Panasonic introduced some sort of chip into the battery, thus preventing the use of 3rd party copies (they simply wouldn’t work), and since the Panasonic batteries were originally about £60 each (!) that was a bit of a killer. However, it appears that it is now possible to get working OEM batteries for £10 each (or less), and so I’ve bought a 2-pack from Ebay. It was the amazing image quality in such a small camera–Leica lens, see–that made me really, really, REALLY want to have one, but what tipped me over the edge was the great reduction currently running on Amazon. Apparently Panasonic are doing away with this camera any time soon, and replacing it with the TZ10. They’re currently selling the TZ7 for £199.99. They say that’s a reduction from £352.85, and whilst I know it’s possible to get it for less than that £350+ figure elsewhere the £199.99 does seem to be a genuine bargain. 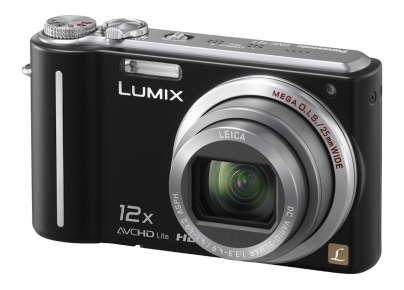 Incidentally, the other one that really tempted me was the Lumix DMC-LX3. That’s even *wider* at 24mm, but it doesn’t have the super-zoom and only goes to 60mm. Having said that, the sensor is large, the picture quality is apparently fractionally better and the battery life is not a problem. It’s more expensive–currently £315.70 on Amazon–but by the time I was reading about it I really had the bug, and that might not have stood in the way of my desire to Have Lovely New Toys Right NOW had I felt that I could live without the zoom. Ultimately I didn’t feel I could, though, and so I went for the TZ7. Phew! This entry was posted on Thursday, May 6th, 2010 at 8:57 am and is filed under Camera, Kit. You can follow any responses to this entry through the RSS 2.0 feed. You can leave a response, or trackback from your own site. So your pictures should be all over the October TGO mag his year then? Those gaiters seem good, eh? Mine came y/day. I have a tip, culled from reading a lot of reviews. Apparently the little stringy things tend to break, so I intend to replace mine with a piece of dyneema (or at least to take a piece of dyneema with me, in case I need it). I have the TZ5. I’ve been very pleased with it. I use it on the IA setting all the time and it generally takes very good pictures. The stability control is also better than my previous Olympus cameras. The TZ5 is slightly bulkier than the newer versions. The TZ10 has built in GPS! I use non-Panasonic batteries with no problems and they seem to last OK. The only criticism I have is the the tripod mount is at one end of the camera which means it’s impossible to use the stickpic. Overall these are really good cameras, especially if you want point and shoot. Great info, thanks! That’s a pity about the tripod mount: I’ve been wondering where it would be. Crossing my fingers that it’ll work with my tiny tripod. Good news about teh battery, though. How exciting! I’ve used it on a Gorillapod and a lightweight Velbon tripod with no problems. If the Stickpic had a locking nut it would be OK but it just uses friction and tends to slip. My TZ4 has worked for me but for a two week stint I needed two batteries or somewhere to charge. Ta, Baz, but (fingers crossed) I think this problem is now solved. I’ve been reading about it over on http://www.dpreview.com, and it seems that there are now OEM versions available that can get round the restrictions. I hope so, anyway! This is shocking behaviour Shirl! As the TGO Challenge is a errr challenge have you thought of using an Etch-a-Sketch. I hear there’s a lightweight version on the cards! Heh… I’m v. glad to say I hadn’t thought of that.